Problem areas. Almost every landscape has at least one, whether it is a rocky spot, a slope, or a place so heavily shaded that design options with plants are limited. When drought strikes, even a normally enviable piece of land is transformed into a problem area. Or what if your land is plagued by the opposite of drought, and you're left with a muddy mess? Fortunately, you have several landscaping allies that present themselves as landscape solutions for dealing with these and other problem areas. If a rocky slope is your problem area, then a rock garden design presents itself naturally enough as a landscape solution. Why not use the terrain's rockiness to your advantage, rather than fighting it? If you live in a region dominated by drought (see below), you may even wish to build a rock garden on flat land, planting the rock crevices with drought-tolerant plants to form a xeriscape. If a rockless incline is your problem area, consider the possibility of importing rock to build a rock garden (see above) from scratch – it will help hold back the soil and cut down on erosion. If you don't care for rocks gardens, specifically, you may be more interested simply in growing ground cover to stop erosion. But a more popular erosion-busting option is to build retaining walls. If rock gardening is not your cup of tea, you might consider the xeriscape as a practical alternative to more traditional yard designs. Although xeriscaping is associated with drought-plagued areas, don't underestimate the benefits it can bring to yards far-removed from the desert. You can save yourself time and money by planting low-maintenance, drought-tolerant perennials, in addition to grouping plants with similar irrigation needs together in your yard. There are many attractive perennials to choose from that hold up to dry conditions. Some of you flooded with excess water runoff may be envious of folks with dry areas and their consequent "problem," considered above. For you, wetness is the problem. If water puddles in an area of your yard, making it unusable (or worse yet, if runoff threatens your house foundation), installing a French drain may be the answer for you. Or perhaps you're simply looking to grow plants in such an area, and everything you try there balks at the bogginess of the soil? In that case, some wetland plants may be the right landscape solution for you. 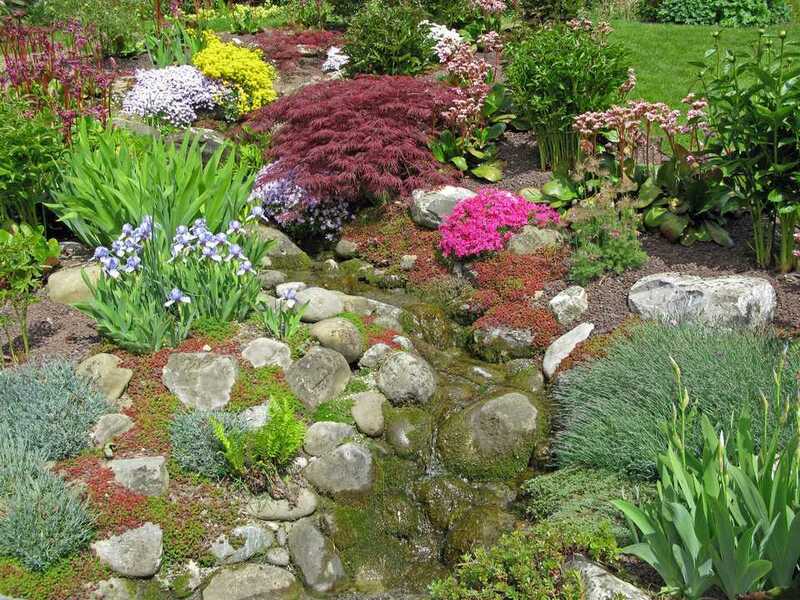 Yet another option is a decorative "drain" of sorts: a dry creek bed. This sort of problem area, too, could be considered the opposite of the sun-battered problem area previously described. If you have a shady spot, don't fight it: fill it with shade-loving plants, such as shrubs that grow in shade. But what if the landscape solution you seek does not concern a challenge presented to your plants by the elements, your soil or your terrain? Now we'll consider some landscape solutions that don't necessarily fall into any of these categories. It isn't a question of needing to "hide" anything. But who wants to live under a microscope? Even good neighbors don't enjoy feeling obligated to acknowledge each other every time they step outside, as if needing permission before continuing on their business. The landscaping solution to this problem is to install some type of privacy screening. But your "installation" options can include growing "living walls", whereby it is trees or shrubs that afford the privacy, not a fence. For those who don't want to have to maintain plants and who'd prefer some sort of fence, instead, that's also an option. Something of a compromise between fencing and plant screens is presented by the option of installing a lattice privacy screen: vines can be planted to cover the lattice and beautify your screen. Perhaps your problem isn't prying eyes, but voracious appetites. There's a whole litany of garden pests that can make short work of your plants and of all the work you've put into growing them. Fortunately, you're not helpless against your plant-devouring foes. Don't like to use poisons? No problem: there are organic landscaping solutions, too. Don't want to remove the pests entirely from your property, preferring instead merely to fence them out? Again, no problem. Just browse pest control resources on groundhogs, rabbits, voles, and deer, and you're bound to find a landscaping solution that suits your needs and tastes. Mulch is one of the unsung heroes of landscape design. It's highly portable, malleable and, for certain types of mulch, you can even make your own! Areas shaded by large trees can be transformed overnight from eyesores to eye-openers by applying an attractive mulch. For all its value, there is much misunderstanding about the use of this landscaping solution, and I receive numerous questions about garden mulch from readers. There are as many types of landscaping mulch as there are landscape challenges. Mulch is sometimes used in conjunction with landscape fabrics. One way to beat problem areas is by employing hardscape elements. They're long-lasting, which cuts down on maintenance time. The landscaping solutions offered by stonework, for instance, form an impressive list. Unlike plants, hardscape needs neither water nor sun, nor do you have to prune it or clean up after it. Unlike most mulches, hardscape projects stand the test of time if built properly. Contemplating such projects raises a myriad of questions about hardscape since hardscape projects encompass a number of specialized fields. Hardscape projects are also initially labor-intensive, but once completed, they can provide visual interest on your landscape for the rest of your life, with little maintenance. An example of hardscape providing a landscaping solution is the use of a stone wall to separate the road from your front lawn. Many plants do not tolerate road salt well. To form a border along the edge of your lawn, a stone wall can be a much more sensible alternative than shrubs or other plants.